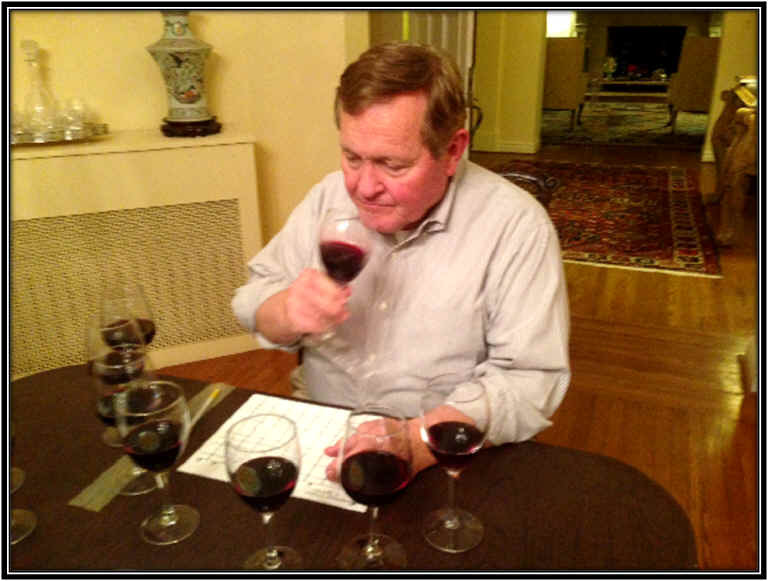 In our previous meeting, the Vino Fino tasters took a look at currently available Chateauneuf-du-Pape wines from the Southern Rhone Valley. We were hoping to find some well-priced bottlings from less well-known properties and it turned out to be a good tasting. 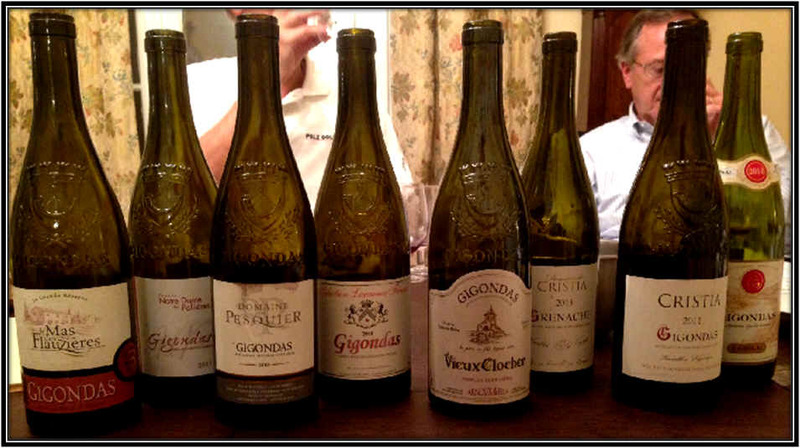 For our October tasting, we thought it might be interesting to take a look at some wines from another Southern Rhone appellation, Gigondas. The wines of Chateauneuf-du-Pape can be made entirely of Grenache if a vintner so chooses, but there is a whole roster red and white grapes permitted. Gigondas, though, caps Grenache at 80% and mandates a minimum of 15% of Mourvedre and/or Syrah. There is a 10% limit on "other" red varieties as we understand this confusing bit of regulations. 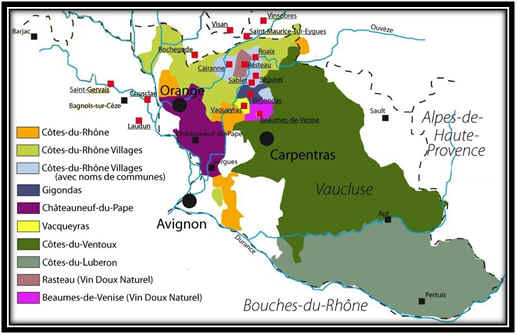 The Gigondas appellation is rather small compared to Chateauneuf-du-Pape. It's located between the village of Sablet just to the north and Vacqueyras to the south. If your vision is exceptional, you may be able to locate Gigondas on this map. We included a wine made entirely of Grenache, but from grapes outside the appellation, as a "mystery" wine. It was also the least costly bottle of the tasting. 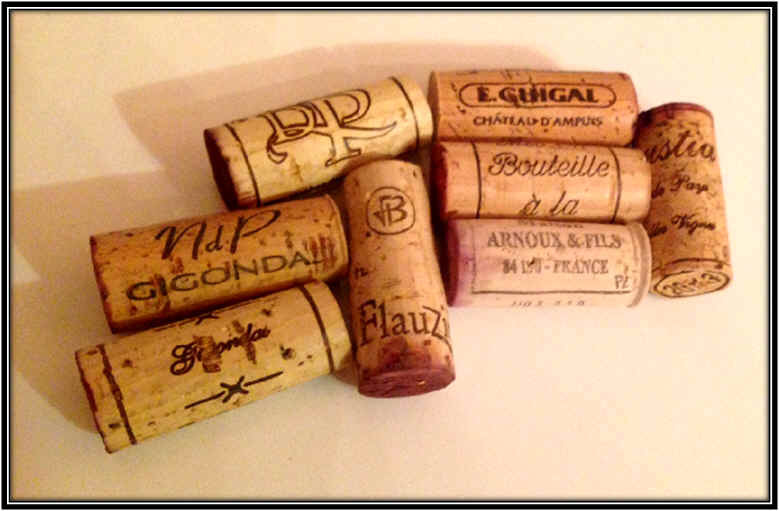 The Gigondas wines, though, ranged from $19 to $44. We had one wine well ahead of the group and 4th place through last place separated by a mere 6 points. Medium ruby in color and clear in appearance, this was a surprisingly last place finisher! I wasn't crazy about the balance of the wine, finding the nose showing ripe, jammy tones and a bit of heat from the alcohol. It's a big, muscle-bound red on the palate, too...simply lacking in charm and elegance. Not a "bad" wine or poorly-made, it's simple too much. But served with some intensely-seasoned food or some sort of Northern African cuisine, this wine might be just the thing. No stars from me, though, as it strikes me as a standard or average quality wine. Three stars would be tops. Clear in appearance and medium ruby in color, this wine showed a mildly spicy fragrance on the nose, along with a suggestion of fairly ripe fruit. It's dry and moderately acidic, while being medium-full in body. Berry notes on the palate, this is a softer, dry red wine. At this stage, it's not especially complex, but it is a nice red wine and fairly typical of the appellation. I gave it a one star rating on my three star scale. Medium ruby in color and clear in appearance, this wine was the "Beaujolais made of Grenache" in this line-up. 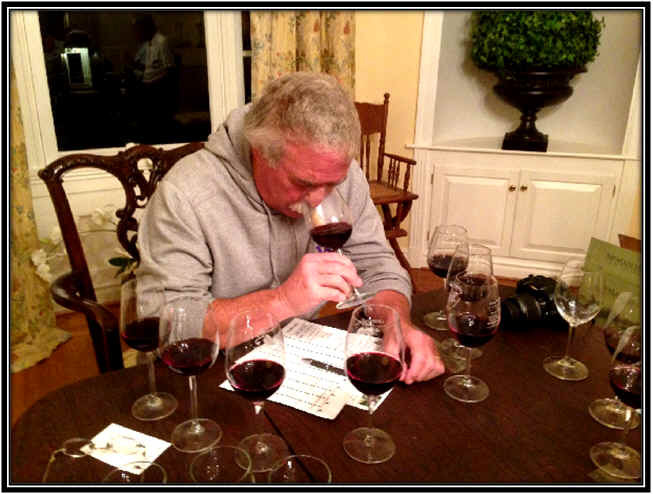 The wine sports the fruity, grapey notes of a good Beaujolais, showing lots of raspberry fragrances and flavors. Medium-bodied and easy-to-drink, it's not at all an attempt at complex wine, but it is a good rendition of what it should be. Best now, in its youth and served at cool cellar temp. Medium ruby in color and clear in appearance, this was a rather charming example of a Grenache-based red. The wine is young and as one might expect, the aromas are youthfully fruity, too. It's dry and moderately acidic. Medium+ in body, this is a charming red wine that's nicely balanced and drinkable now. It probably will cellar nicely for 5 to 8+ years. I gave it one-and-a-half stars. Deep ruby in color and clear in appearance, this was a showy wine if you're on the right wavelength or its a bit repulsive (apparently) if you're not. I liked the dark fruit notes of this wine and it seemed to me to be quite complex and nicely intense. It's dry and moderately acidic, with medium+ body. 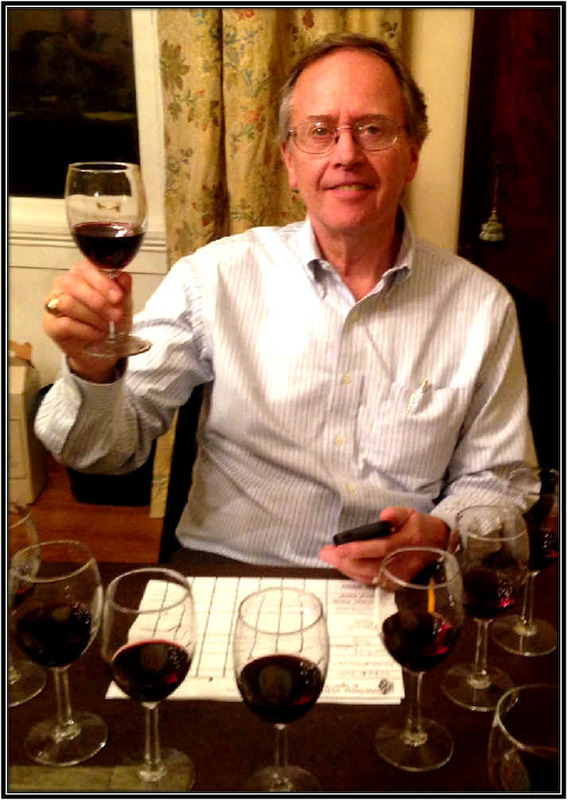 All of those elements are confirmed on the palate and the wine is big and fairly young. A couple of tasters found some quirky or funky notes here, causing them to rank this last. I was a fan of this slightly unusual character and gave this a two star rating. I expect this will age nicely, too. Medium ruby in color and clear in appearance, there was a decidedly brambly quality to the fruit. I found a berry quality on the nose with some garrigue-like spice notes and a touch of pepper. It's dry and nicely acidic, with medium body. It's moderately intense on the palate, showing a bit of power. I gave it a one star rating, though it might merit a higher rating with several years of cellaring. Clear in appearance, this had a medium ruby color. The nose was quite enchanting here, showing spice tones and some red berry fruits. It's a tad ripe, but short of being jammy. Dry and medium level acidity here, with medium body. Lots of red fruit from the Grenache...very pretty, though the wine seems a shade hot from the alcohol. I still gave it a one-and-a-half star rating. Ruby in color with good clarity, this wine shows nice red fruits, a background of light wood and a touch of spice. 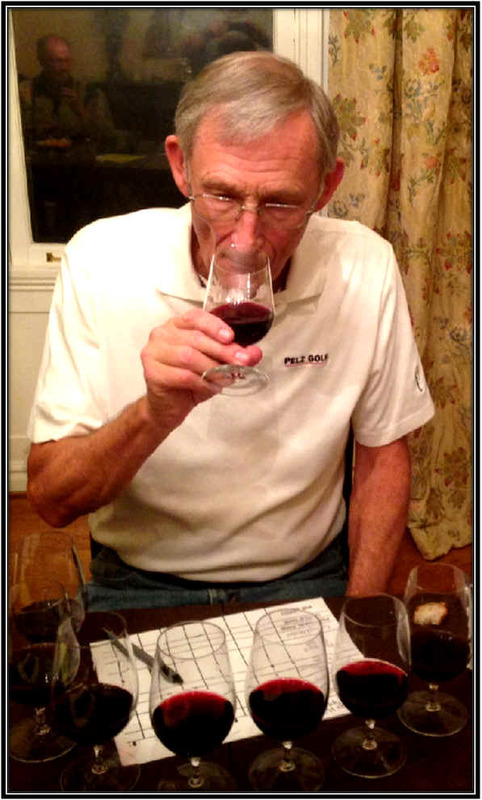 It's dry and medium bodied, with good flavors confirming the nose. The wine was simply brighter and more polished than the rest of the field, showing terrific fruit and being nicely balanced. Good red fruit all through the palate...drinkable now...should last 5+ years, too. Two stars.